Over the years there have been several ‘children’s’ books released that have appealed more to an adult audience. You may remember the clever Go The F*k To Sleep, famously narrated by Morgan Freeman, and its sequel You Have To F*king Eat. Then of course there are the parody versions of well-loved children’s books that have more of an adult theme, some of which I have reviewed previously (see http://acomfychair.com/classic-kids-books-parodied/ ). This book fits into the first category- it isn’t a play on an already known book. 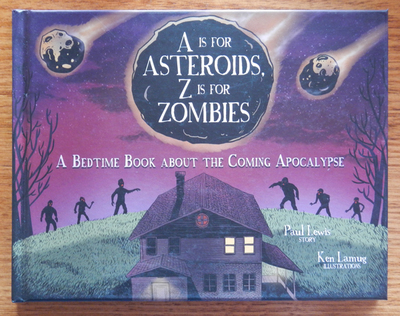 Instead, this original story lists (in rhyming format) an A-Z of possible apocalypse scenarios that could happen one day in the future, if you’re inclined to believe it. This is a great gift book for all those naysayers out there who believe the end of the world is nigh. It is funny, topical (as you can see by the above reference to Donald Trump), cleverly written, and may offend at least one person that you know. I probably wouldn’t recommend reading it to an actual child, but for adults, it is good for a laugh.